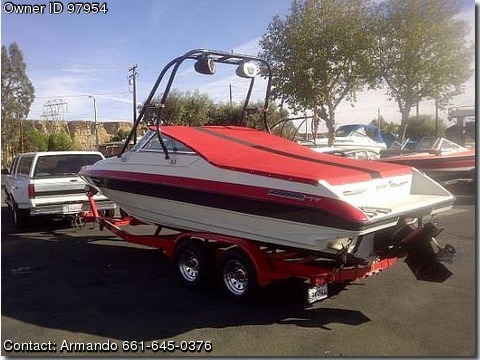 Please contact the owner directly @ 661-645-0376 or mandomanent@hotmail.com... 1994 Reinell 2400 RXL 24ft. Cuddy, 7.4 454 360HP Mercruiser and Bravo One outdrive with 2 props, stainless steel and aluminum,235 hrs..
Tandem Pacific trailer custome painted to match , chrome wheels, dual batteries wPergo switch,, 6ft keel guard, depth finder,hydraulic trim tabs, porta-potty, sink,Clarion stereo with 8 Alpine marine speakers and tower speakers, Wakeboard tower, custom matching cockpit cover, snap-on top and full zip enclosure, upholstery is like new, lots of extras. great running boat, just don't use it enough anymore, I do have service records.